ADELA, a daughter of King St. Dagobert II (23rd December) and sister of St. Irmina of Oeren (vide infra), and disciple of St. Boniface (5th June). Following the death of her husband, St. Adela received monastic tonsure and founded the monastery of Palatiolum in Pfalzel near Trier, serving as its first abbess. St. Adela reposed circa 730. ALBERIC (ALBERT), a tenth century monk at Gladbach Abbey in the present-day city of Mönchengladbach, North Rhine-Westphalia, Germany. BRUNO, a monk at Ottobeuren Abbey in Bavaria who reposed circa 1050. CARANUS, (Seventh Century), nothing is known of the life of St. Caranus aside from a commemoration in the Aberdeen Breviary, which states he laboured in the east of Scotland. DELPHINUS, second Bishop of Bordeaux, and friend of SS. Ambrose of Milan (7th December) and Venerius of Milan (4th May). An indefatigable foe of the Priscillianist heresy, and was a key figure in the conversion of St. Paulinus of Nola (22nd June), St. Delphinus reposed circa 404. GREGORY of SPOLETO, (Date Unknown), no reliable information on St. Gregory’s life is extant, but he is believed to have been a priest who was martyred in Spoleto during the persecutions under Maximinian Herculeus. 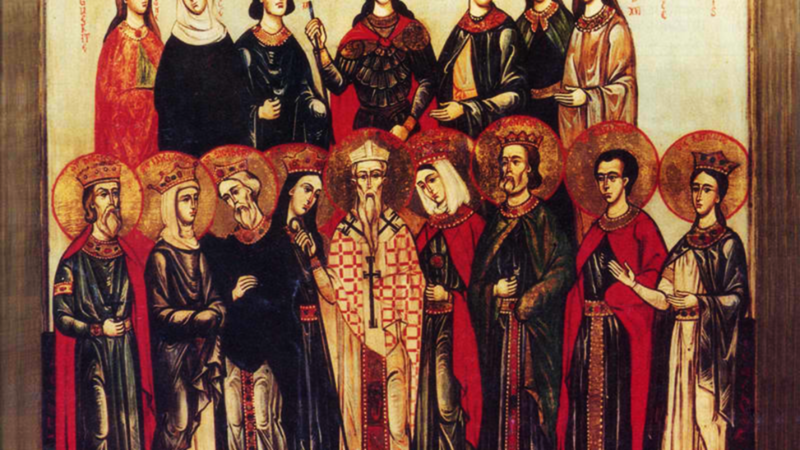 IRMINA, a daughter of King St. Dagobert II (23rd December) and sister of St. Adela of Pfalzel (vide supra), St. Irmina was widowed on her wedding day. She then prevailed upon her father to build a monastery for her at Oeren, where she spent the rest of her life as a nun, reposing circa 708 - 716. MARTYRS of TRIPOLI, (Date Unknown), an unknown number of martyrs at Tripoli in Africa Proconsularis, of whom the only details still extant are the names of six of them: SS. Lucian, Metrobius, Paul, Zenobius, Theotimus, and Drusus. TARSILA, an aunt of St. Gregory the Dialogist (3rd September), and sister of St. Emiliana (5th January). St. Tarsilla lived as a nun in her parents’ home, reposing circa 581. VENERANDUS, consecrated Bishop of Clermont in Auvergne 385, he served until his repose in 423. St. Venerandus was a great supporter of evangelism throughout the entire region.